In the past Ginzu had entered the electric knife market with their Ginsu Freedom Carver Electric Knife which got very poor reviews for not holding a charge and being under powered. Ginsu is now trying to enter the market again by introducing a new knife, the Ginsu Outdoors Electric Fillet Knife. The new Ginsu fillet knife was designed by Robert Radi, who also designed their American Angler electric hook and knife sharpener in 2001. This Ginsu electric knife is specifically designed for fishermen and includes two types of blades, one for salt water and one for freshwater. It also includes a 12 Volt plug and a 110 volt converter for easy use when you're not at home. 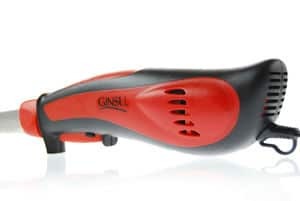 The Ginsu electric fillet knife is also ergonomically designed to be easy to use, lightweight, and attractive. Ginsu claims that the knife will hold a charge long enough to fillet a large number of fish so hopefully they have adopted a new cordless battery technology than their last knife. The fillet knife is also supposed to have the "coolest running motor of any electric knife". We will see if Ginsu's second electric knife offering is any better than their first poorly made electric knife. We hope so since a good cordless knife is something we could definitely use and is currently lacking in the market. Why Use an Electric Kitchen Knife? The Best Cordless Electric Kitchen Knife? ©Primolicious LLC. 2019 All Rights Reserved for Electric Kitchen Knife.